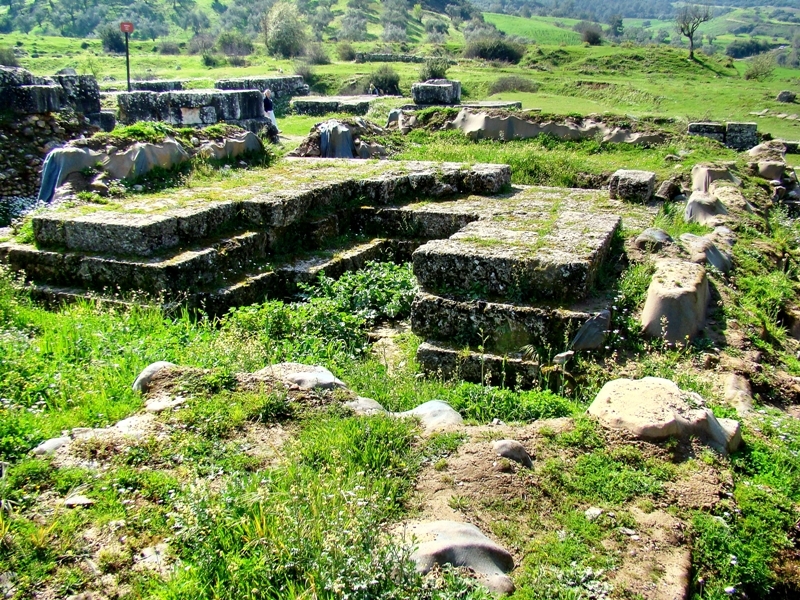 The city of Thyatira was another of the cities mentioned in Rev. 2-3, where the “seven churches which are in Asia” were addressed by the Apostle John. 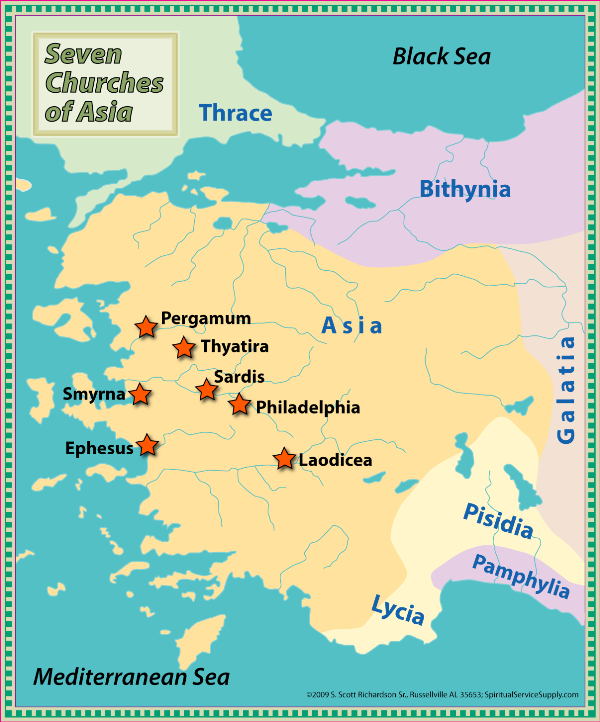 Map below, by Scott Richardson, shows the location of Thyatira as well as the other cities. Map Seven Churches of Asia. By Scott Richardson. It occupied an important position in a low-lying ‘corridor’ connecting the Hermus and Caicus valleys. 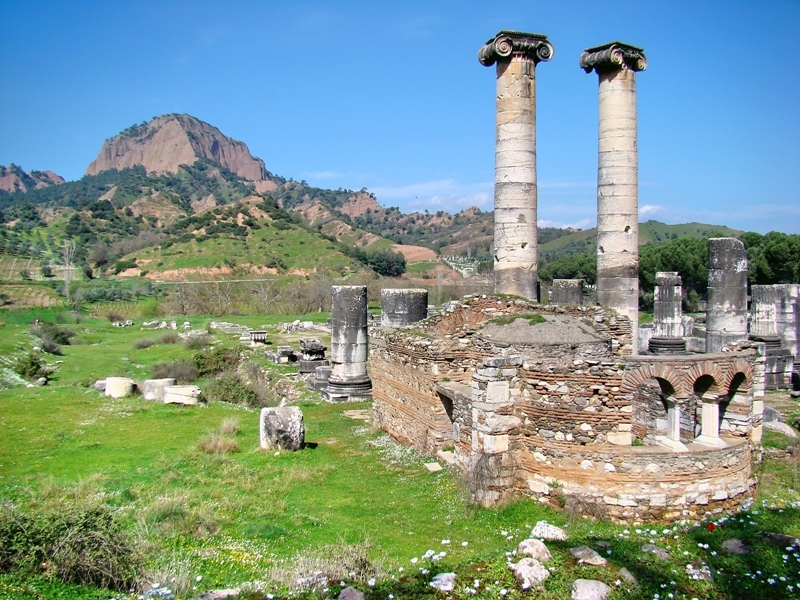 It was a frontier garrison, first on the W frontier of the territory of Seleucus I of Syria, and later, after changing hands, on the E frontier of the kingdom of Pergamum. With that kingdom, it passed under Roman rule in 133 bc. But it remained an important point in the Roman road-system, for it lay on the road from Pergamum to Laodicea, and thence to the E provinces. It was also an important centre of manufacture; dyeing, garment-making, pottery and brass-working are among the trades known to have existed there. Archaeologists have uncovered evidence of many trade guilds and unions here. Membership in these trade guilds, necessary for financial and social success, often involved pagan customs and practices such as superstitious worship, union feasts using food sacrificed to pagan gods, and loose sexual morality. This evidently explains the reference to Jezebel in the letter. In the OT, Jezebel was the wicked woman from Phonecia that Israel’s king Ahab married. She brought with her Baal worship, with all of its immorality. Within the church at Thyatira there was a modern Jezebel, the counterpart of the one in the Old Testament. She was calling herself a prophetess, and deceptively teaching church members there that it was permissible for them to commit sexual immorality and to eat things sacrificed to idols (Rev. 2:20). To make matters worse, she had been given opportunity to repent, but did not want to repent (v.21). She was wrong to teach this, and the church was wrong to put up with her! Thyatira. 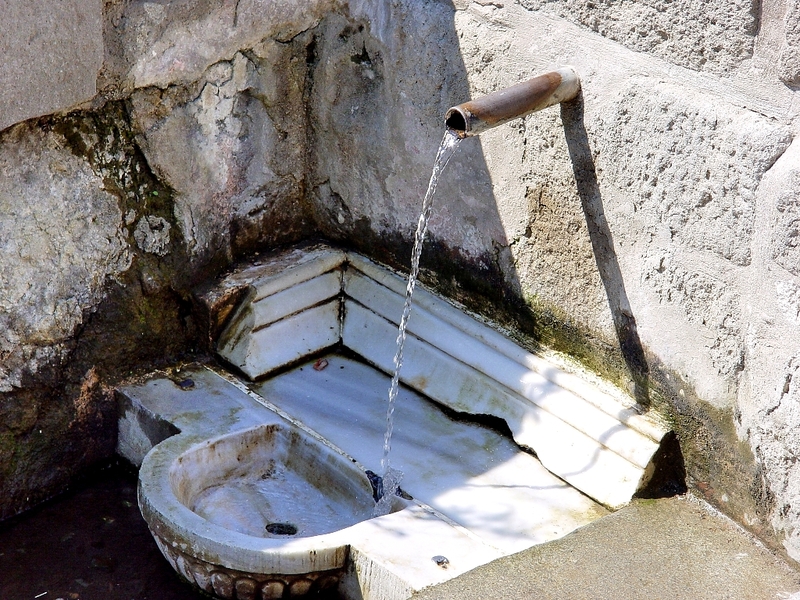 Modern Akhisar. Photo ©Leon Mauldin. 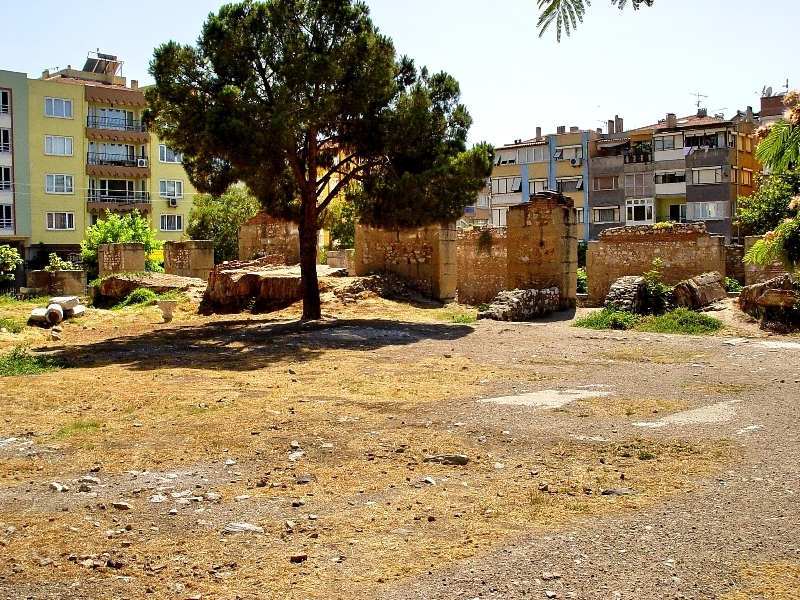 There is not a great deal to see of ancient Thyatira, because as is so often the case, a modern city has been built on the biblical site. But a limited amount of excavation has been done. 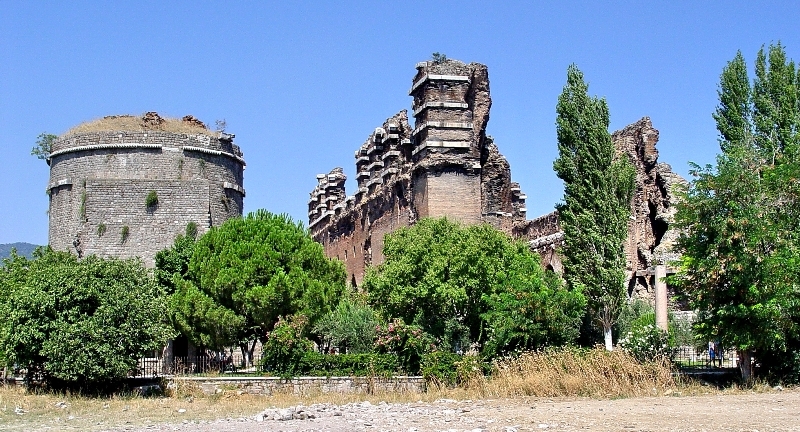 Some Roman ruins of arches and other fragments can be seen in the photo below. Thyatira. 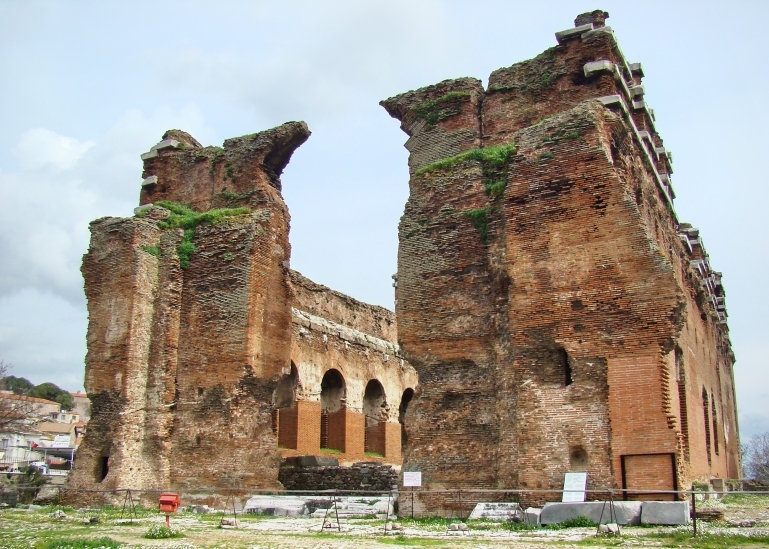 Roman Ruins. Photo ©Leon Mauldin. 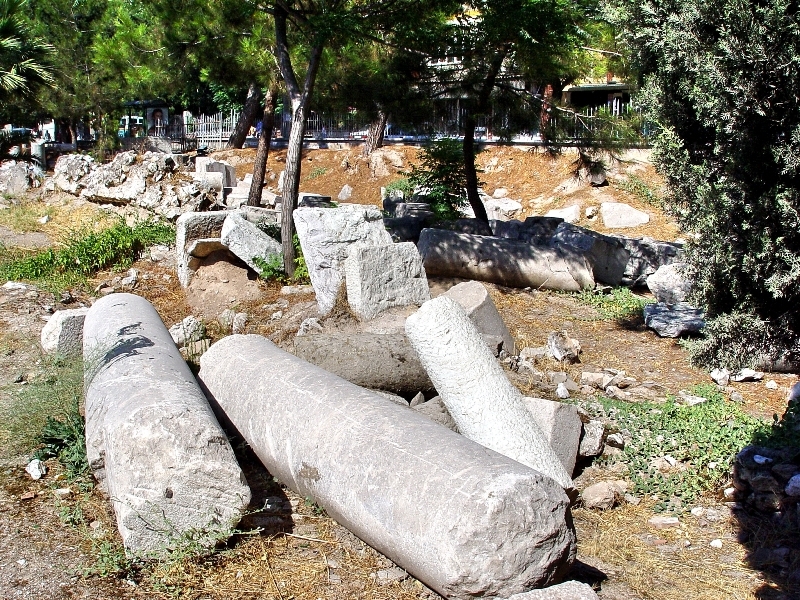 Photo below shows Roman columns which have been uncovered. Thyatira. Roman Columns. Photo ©Leon Mauldin. 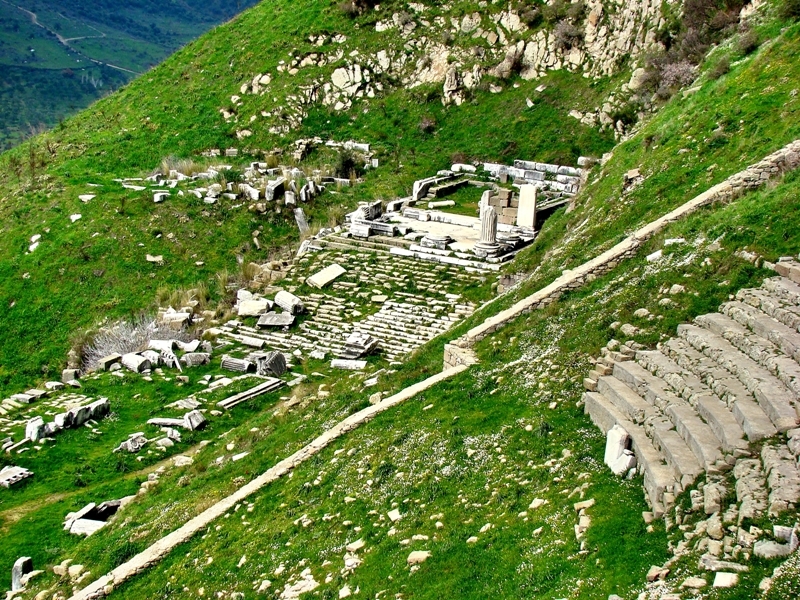 We have been looking at the biblical city of Pergamum, the city where one of the seven churches of Asia (Rev. 2-3) was located. 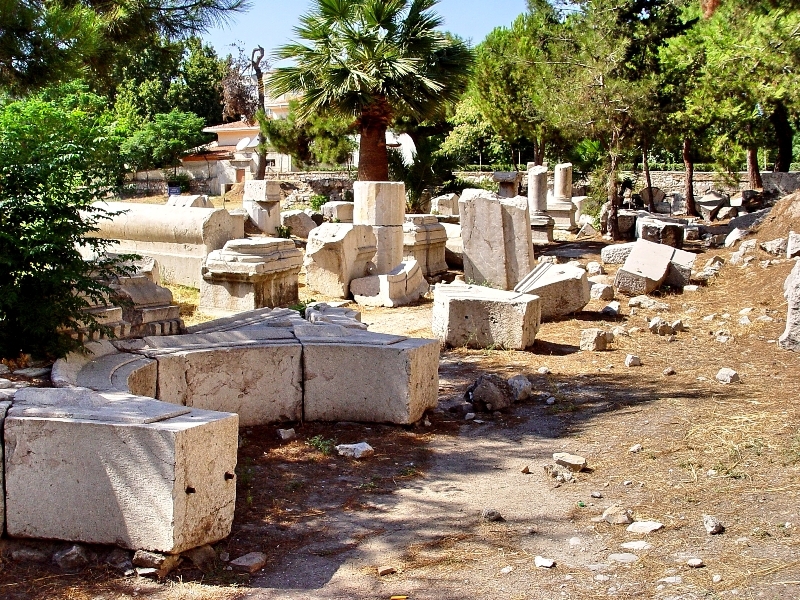 Our last post featured photos from the Asklepieion, where the god of healing, Asclepius, was worshiped. There were other famous temples dedicated to this medicine god at Epidaurus in north-eastern Peloponnese, also on the island of Kos, as well as Trikala, and Gortys. 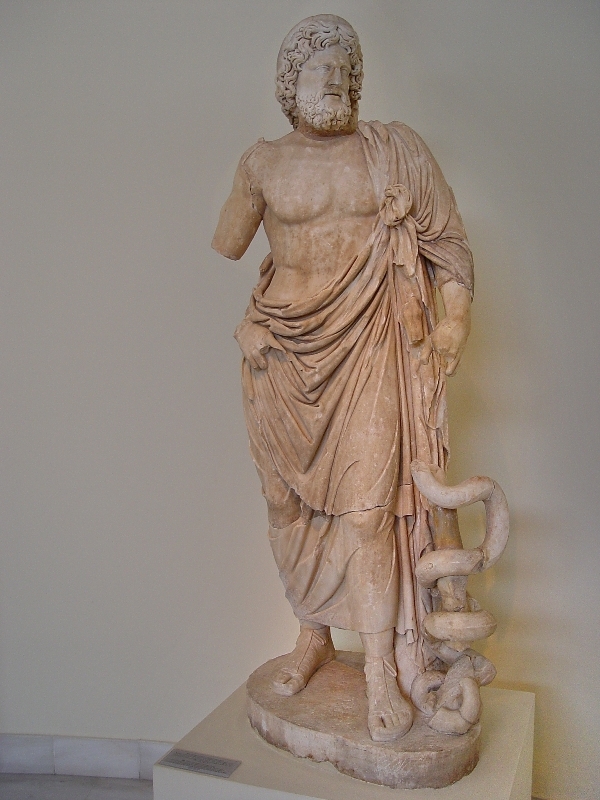 This photo is a statue of Asclepius on display at the Athens Museum. Notice the serpent intertwined on his staff. Asclepius. Athens Museum. Photo ©Leon Mauldin. 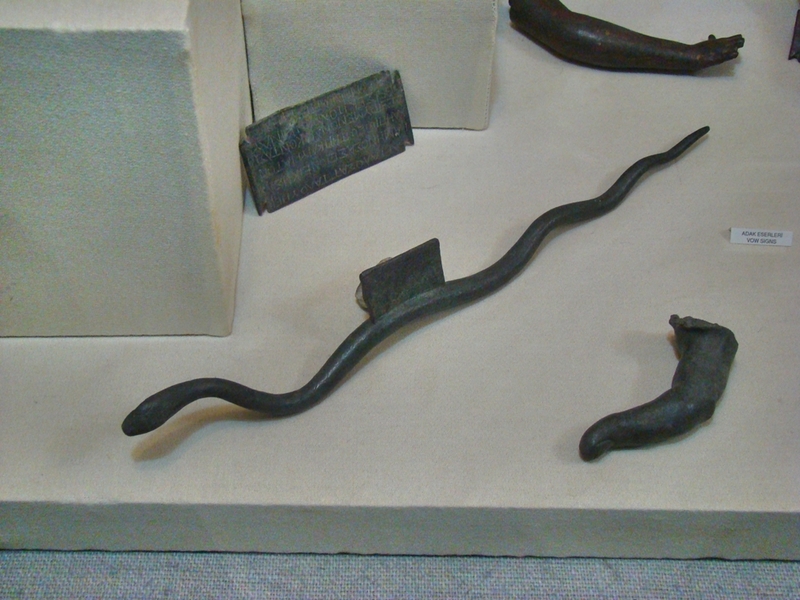 The museum at Pergamum, modern Bergama, displays a serpent, symbol of Asclepius, along with votive offerings left by those who traveled there for healing. Serpent, symbol of Asclepius. Photo ©Leon Mauldin. 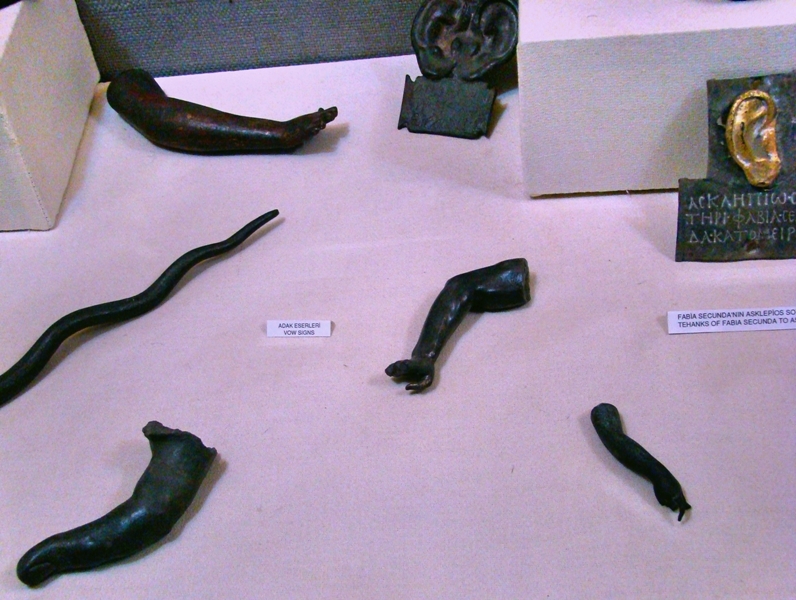 Here is a shot of body parts, left as votive offerings to the god Asclepius. Body Parts, as Votive Offerings for Asclepius. Photo ©Leon Mauldin. Temples devoted to Asclepius served a dual purpose, as not only a place of worship for the god, but also a luxury health spa of sorts, i.e., supposedly a healing center. 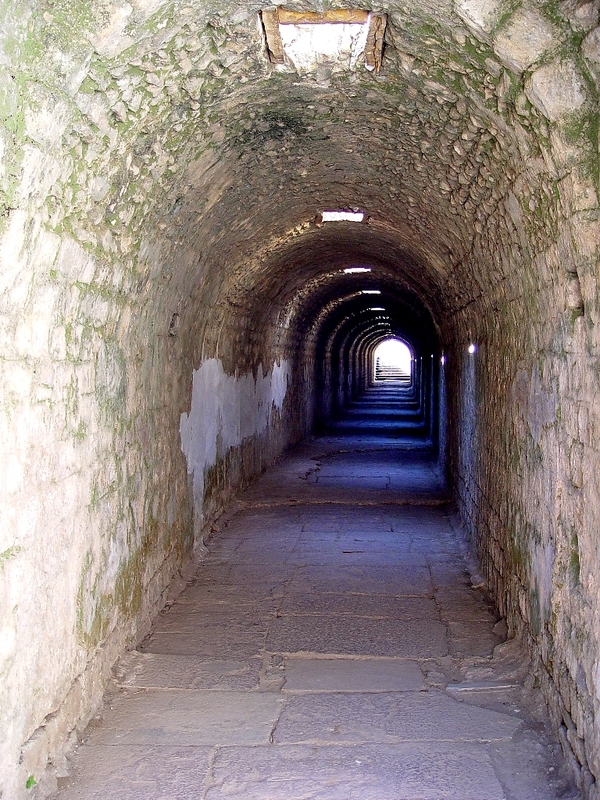 The patients would travel through the sacred passageway, seen in photo below. Sacred Passageway. Photo ©Leon Mauldin. You see the openings which let in light. Also it is suggested that “physicians” may have spoken down to the patients as they moved through the passageway, speaking encouragement with their incantations, etc. 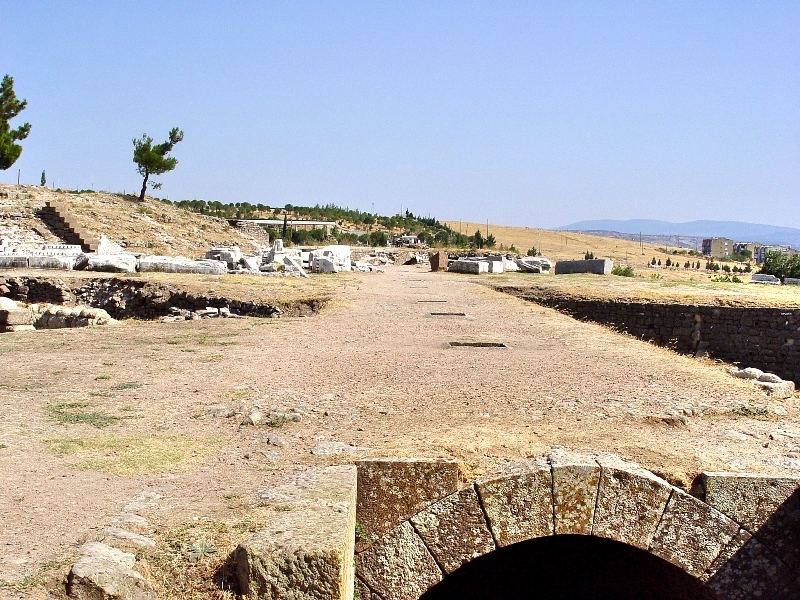 Asklepieion Sacred Passageway, top. Photo ©Leon Mauldin. When Jesus wrote the church at Pergamum, He described the Christians there as dwelling “where Satan’s throne is” (Rev. 2:13). Some see in that a specific reference to Asclepius, with his serpent symbol. Satan appeared in the Garden of Eden in the form of a serpent. He is called “that serpent of old, the Devil and Satan, who deceived the whole world” (Rev. 12:8; cf. 2 Cor. 11:3). 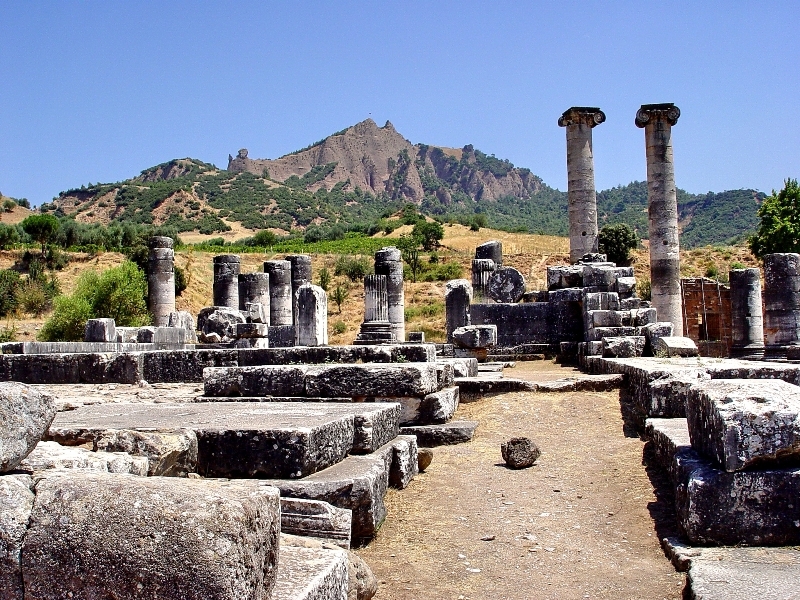 Others suggest that Jesus is referring to the prominent worship of Zeus there at Pergamum. 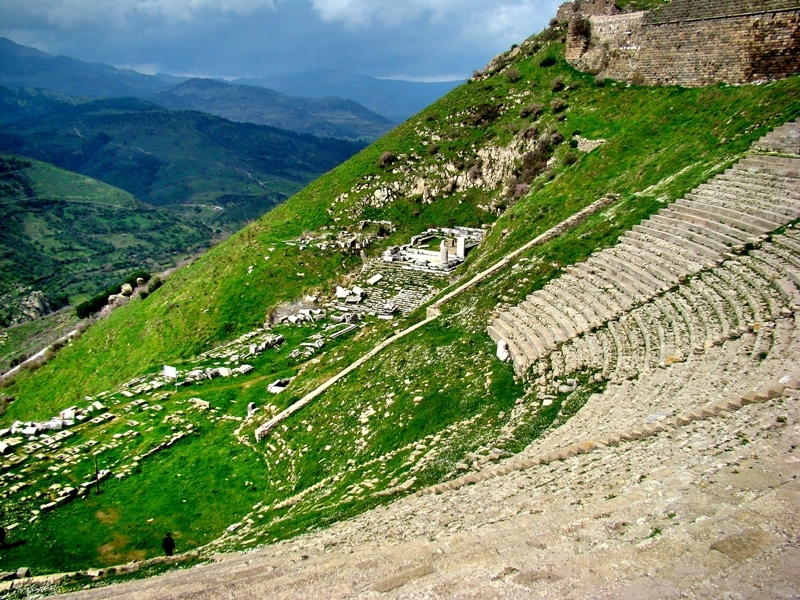 Still others would say that it is Pergamum’s position as a center for imperial worship that is under consideration. Not to mention Bacchus, the wine god! It is possible that Jesus had in mind specifically one of these false systems, but it may well be that it is a combination of all of the above that gave rise to His description. It is instructive to consider what Jesus does NOT tell the church to do. He doesn’t tell them to pack their bags and move to some other location where it would be easier to live the Christian life. He expected them to be faithful where they were, to be lights in that world of darkness, to do what was right, even when they lived next door to Satan! 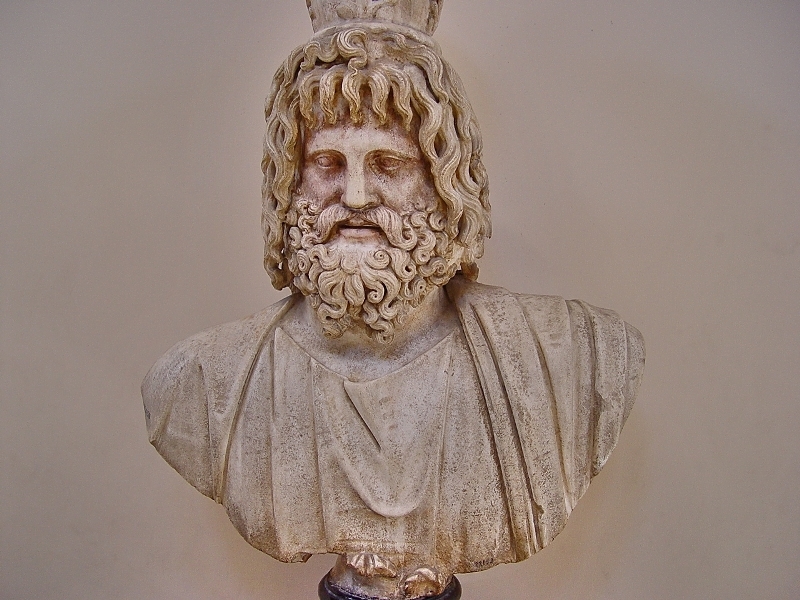 In Greek mythology, Dionysus, a son of Zeus, was the wine god. He was also known as Bacchus, his Roman designation. 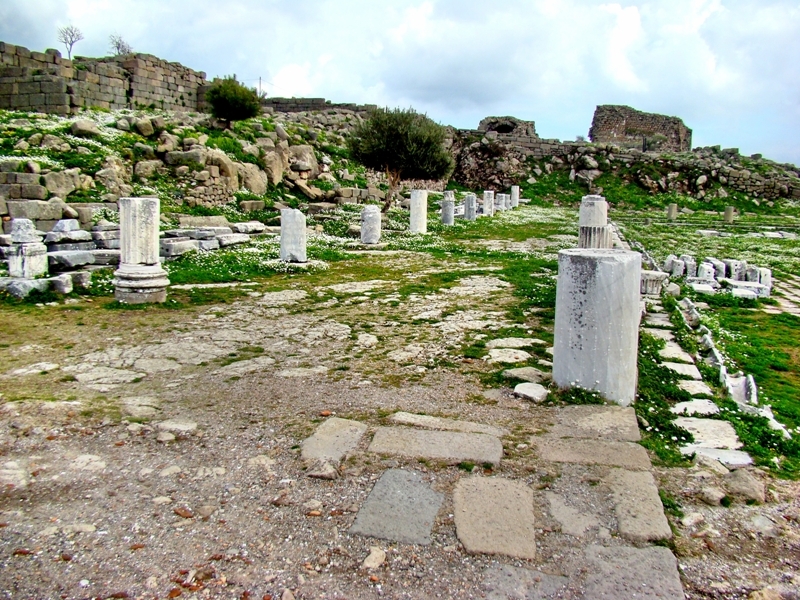 As we continue to post photos of Pergamum, today we include the temple of Dionysus. 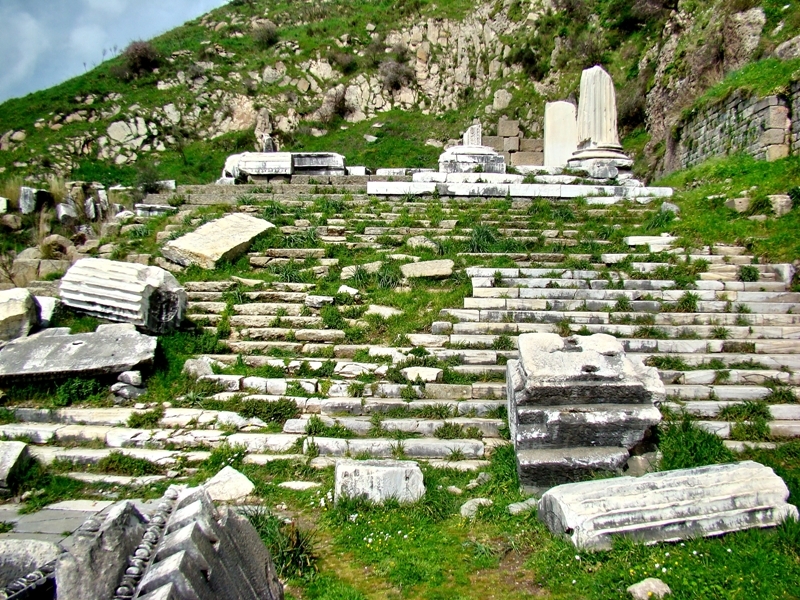 The photo below shows the remains of the temple in the center, to the right of the theater. 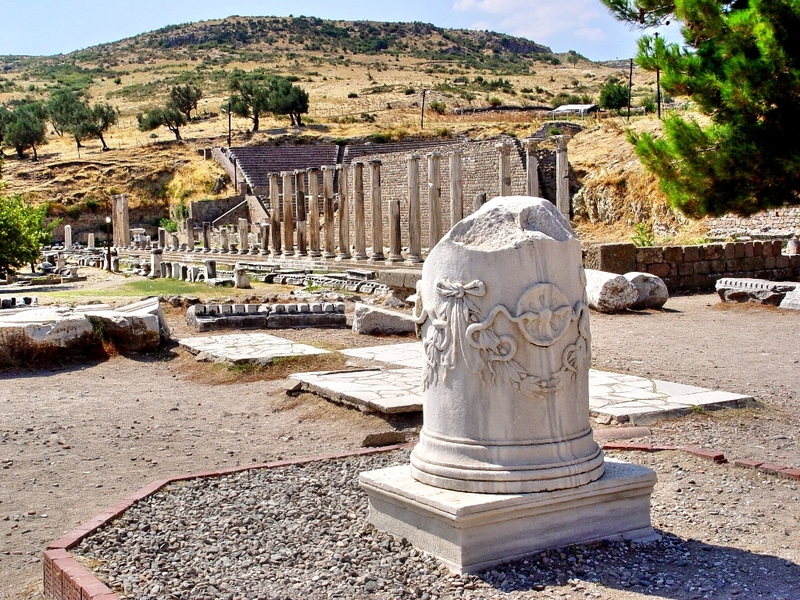 Temple of Dionysus at Pergamum. Photo by Leon Mauldin. 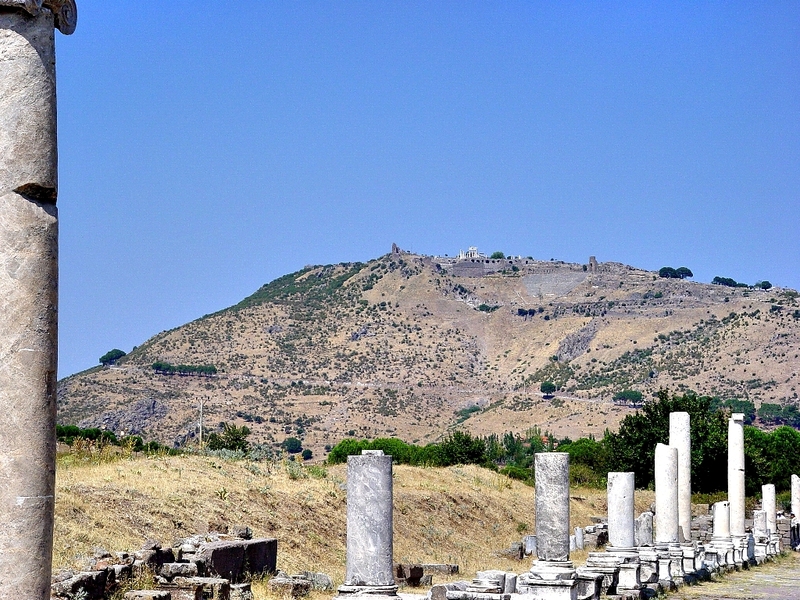 Temple of Dionysus at Pergamum, closer view. Photo by Leon Mauldin. Worship of this deity predictably included wild drinking and drunkenness. Below is a view showing the approach to the temple. Twenty five steps led up to the porch. 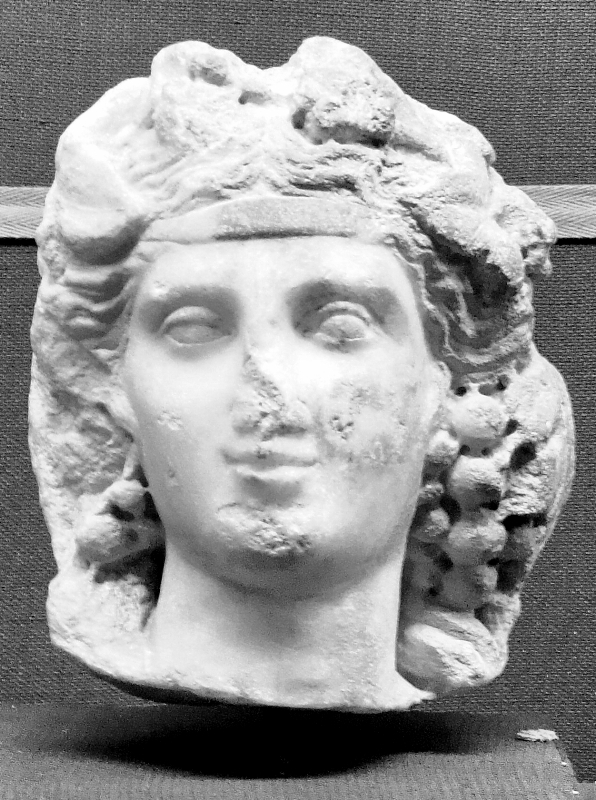 On the monthly celebration of the king’s birthday, the Jews were taken, under bitter constraint, to partake of the sacrifices; and when a festival of Dionysus was celebrated, they were compelled to wear wreaths of ivy and to walk in the procession in honor of Dionysus. Sometimes people say that the Bible was fine for the culture of the 1st century, but not for the 21st century. In reality, the Bible did not conform to the culture of the 1st century at all. God’s word then and now calls for people to be His own special people, not conformed to the world, but transformed (Rom. 12:1-2). Dionysus/Bacchus, the wine god. Izmir Museum. Photo by Leon Mauldin. …when owing to the rivalry between King Ptolemy and King Eumenes about their libraries Ptolemy suppressed the export of paper, parchment was invented at Pergamum; and afterwards the employment of the material on which the immortality of human beings depends spread indiscriminately. (Vol. 5, Num. 2, p.51). Parchment was made from the skins of goats and sheep. It is much more durable than papyrus. Biblical manuscripts were written on both parchment and papyrus, but the parchment tends to fair better with the passing of time. The Latin pergamena means “paper of Pergamum.” Paul wrote Timothy, “When you come, bring with you the cloak I left in Troas with Carpas and the scrolls, especially the parchments” (2 Tim. 4:13, NET). 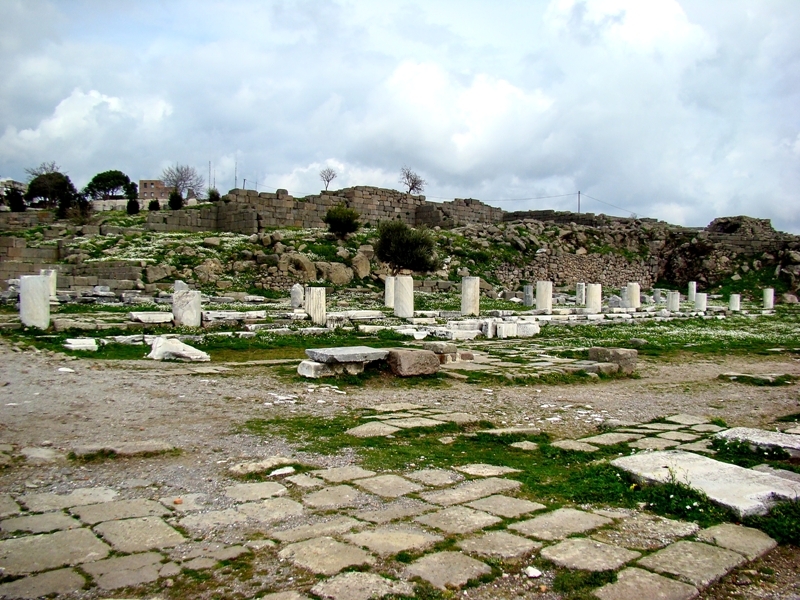 Today’s posts features two photos of the site of the famous library of Pergamum. In this first photo we are standing with the sanctuary of the temple of Athena at our back; the foreground captures part of the court of the temple. The legend is that Mark Antony gave the 200,000 volumes housed in this library to Cleopatra in 41 B.C. Pergamum Library close up. Photo by Leon Mauldin. You are currently browsing the Leon's Message Board blog archives for May, 2010.